Club Penguin Cheats by Mimo777 Club Penguin Cheats by Mimo777: Penguin of the Week: Herry347! I love Red v Blue snowball battles at the Snow Forts! Guess what? Herry347 has made his very own Red v Blue battleground at his igloo, which looks EPIC! 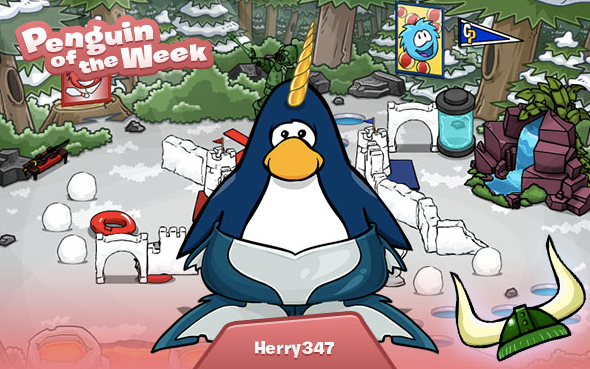 As well as his igloo being totally ace he has dressed his penguin as a narwhal – amazing!! Do you have a buddy that's the coolest penguin around!? Nominate them for the next Penguin if the Week! What a waste of a Green Viking Helmet. He gets it because he made a Red vs Blue igloo. Still far better than that person who became POTW for dressing like a pumpkin. Lolz look at that wookie with a cookie narwhal!